Featuring Shore OO 40 Durometer hardness and elongation over 1,000%, NTG-7 suits applications requiring soft elastomeric material with cushioning effect.Â Polyurethane molding/casting material offers good tear strengthÂ and less tacky surface without use of plasticizer. Since gel is viscoelastic, it slowly/gently absorbs pressureÂ at low compression depth, and its deflection increases gradually as it is pressed down deeper.Â In addition, solid gel does not bottom-out easily like flexible foam would. Historically, polyurethane gel elastomer materials always have been used inside of flexible film or coated fabric encapsulation structures due to their weak physical properties and sticky surfaces of the cured parts. 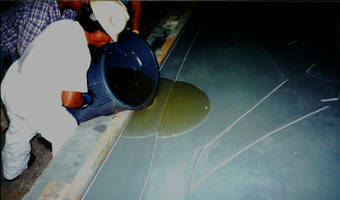 The encapsulation method takes extra processing steps, thus more expensive to produce. We developed a new formula, NTG-7, which is formulated to make Shore OO 40 Durometer hardness viscoelastic polyurethane gel molding/casting material with a less surface tack, better material strength, and a very high elongation (over 1,000%). This provides processor to mold soft PU gel part directly in molds with a much higher mold-cycle rate. NTG-7 is one of our polyurethane gel formulations designed to service applications require a soft elastomeric material with good cushioning effect, high elongation property, better tear strength, and less tacky surface without use of plasticizer. NTG-7 is viscoelastic; it slowly/gently absorbs the pressure at a low compression depth, and its deflection increases gradually as it is pressed down deeper. As it is a solid elastomeric gel, it does not bottom-out easily like flexible foam would. With these properties, NTG-7 can be a good candidate for cushioning/padding products without use of flexible film encapsulation. Comparing to other polyurethane gel formulations, NTG-7 has better tear resistance and elongation properties. Thus, NTG-7 may be used in places of soft TPE compounds. While TPE compounding requires a high heat, NTG-7 can be processed at near room temperature. The tooling and processing equipment can be less expensive. NTG-7 may be an ideal material to replace TPE for short runs, specialty products, and prototyping. Typical and more traditional polyurethane gel formulations are usually used with flexible film or coated fabric encapsulation because of the weak physical properties and sticky surface. NTG-7 may be used in the similar applications without film encapsulation. NTG-7 has stronger physical properties and less sticky surface comparing to the other traditional polyurethane formulas. While typical gel formulations require a very slow curing pattern in order to avoid shrinkage when they are cast into film cavities, NTG-7 can be catalyzed and/or heated to cure much faster to significantly improve the mold-cycle time. The Technical Data Sheet for NTG-7 is on the following page. 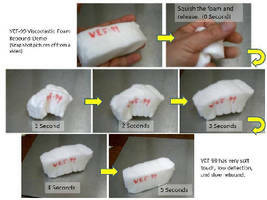 Polyurethane Foam Resin exhibits viscoelastic behavior. 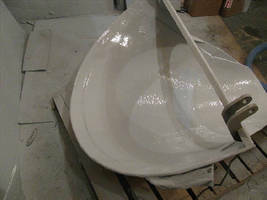 Polyurethane Gel Casting Resin Formula features non-tack surface. Sticky-Pad Materials secure cell phones and tablets.